How would you go about creating a "belly dance" wedding gown? Thank you in advance for your help! This is an interesting challenge. I would love to design a belly dance bridal costume for someone, including myself! Most important is that you wear something you love and that looks beautiful on you. Several design issues come to my mind at once. I assume you are wanting something with a bare middle. I've illustrated 3 versions: tribal, cabaret and beledy. Click on the diagram to the right to see it in more detail. For a tribal costume you'd want a very full skirt or pants, and a midriff-baring top or backless choli. A beladi look would call for a fitted dress with narrow skirt an flared or long "Persian" sleeves. A cabaret ensemble would include a hip belt and rnate bra with fringe or draped beads. The basic costume would be designed as you would any other belly dance costume, to flatter your figure — the color, the details, and the materials would create the bridal look. Some sort of cover-up would be a good idea, just as it is when you perform anywhere. You may need this just for going to and from the event, or during the ceremony if you plan to be in a church or another dignified venue. One or more beautiful long chiffon veils with or without fancy stitched embellishments could be draped around the costume, or an overdress could be worn. I imagine this overdress designed like a long coat, with a decorative fastening at center front, such as one or two jeweled buttons. It could be sheer, like chiffon or lace, or opaque, like a white brocade. The sleeves might be long "Persian" sleeves. The sleeves or hem could be decorated with tassels or ornate trim. It could be scoop-necked, or cut out around the bust like a ghawazee coat, if you want the beaded bra to show. Another alternative might be a loose, flowing beautifully trimmed caftan with a front opening, like one you might wear after a performance. The front opening is important, because you do NOT want to be pulling anything over your head — it will mess up your hair, make-up, and headpiece, if you're wearing one. Wear any color that you love, but of course the white and ivory automatically tends to look bridal (if accompanied by other bridal details). Ivory, instead of white, is flattering to most blondes and redheads. Dark brunettes, and dark-skinned complexions, often wear white well. Gold accents warm up white, if solid white seems too stark. Sequins, appliques, jewels, and trims come in white, silver, gold, iridescent ("iris"), pearl, crystal, rhinestone, and any of these or a combination would be beautiful. Of course, anything sparkly or beaded is appropriate for either bridal or bellydance. I've always thought a train was a liability, but if you want one for the sake of tradition, a detachable semicircular train can be added with hooks or buttons and loops to the back of the skirt. Or it could be a short 1-2-foot "sweep" train or "fishtail" that is part of the skirt and may be fastened to the skirt back later in a pretty drape to get it off the floor. If your look is "tribal", you would probably want a very full skirt with tiers and ruffles. If your look is cabaret, any style of skirt would be fine, but a mermaid, or fluttery layered skirt, maybe with lace pants such as those shown in the photo to the right, is what I'm picturing. A beledi dress usually has a straight or narrow tapered skirt, but a fishtail may be added. I think a headpiece would be a perfect bridal touch. This could be a simple headband with beads or tassels, a Ghawazee-style upright tiara, an Egyptian headdress with long beaded strands (good for straight hair), or a wreath of silk flowers, which would be especially good for curly hair. I said silk flowers! Real ones will look lovely — for an hour, before they begin to wilt. If you have very long hair, you might want to braid it, weaving ribbons or strands of pearls or flowers into the braids. A traditional gathered tulle veil could be sewn to these, but since you are a belly dancer, I think an Arabic style of veil softly draped from the headpiece would be better. A small one could be tucked into the headband on one side or the back, or both sides, and be draped under the chin harem-girl style. For a tribal look, a larger veil could be draped over the head, and the headpiece placed over it. Or a headpiece with coins, if it harmonizes with your outfit. Even a "bridal turban" could be worn. What Kind Of Fabrics Should Be Used? You could either use traditional bridal materials such as satin, silk, pearls, and lace, or add a lot of bellydance-like materials such as beaded fringe, chiffon, and sequins, or coins and tassels. Or go for a combination. It depends on just how "bridal" you want to look, but I think a combination would be nice. If you check the bridal department of a large fabric store, you'll find a variety of exquisite fabrics in white and ivory, some with sequins, sparkles, metallic threads, etc. If you can't afford the expensive sequined lace, buy the best plain lace you can afford and use jewel glue and sparkly fabric paint to add sequins, rhinestones, and crystals, to the lace pattern. Or sew them, if you have LOTS of time! 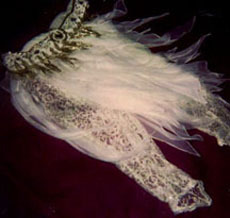 You'll also find beaded and sequinned appliques to decorate your bra, belt, and headpiece, and beaded trims and fringes. You'll find pearls by the bag or by the yard, and these are relatively inexpensive. Hanging beads, such as fringe, tassels, or draped strands will emphasize the bellydance look, while pearls are associated with brides. A bead store should have white, crystal, silver, and iris beads by the bag or skein too. If you use silver, it should be a bright white-silver and not the dark pewtery silver. If you use satin, make sure it's not the cheap kind that wrinkles easily. Crush it in your hand to test this. Do the same with silk, or any fabric. Generally lace doesn't wrinkle. Or if you want bare arms, you could decorate them with beaded or tasseled armbands. (See How to Make Armbands.) You could also drape some wisps of silk chiffon from these bands, or strands of pearls. (See Sleeve Variations.) If your look is tribal, your sleeves could be adorned with rows of small tassels or dangling beads, tiny mirrors, or other trim. The photo shows a white costume of mine with fluttery silk chiffon skirt, sparkly lace pants (the ones in the illustration above), and crystal stones that I thought looked "too bridal", so I added a lot of silver and gold beads and gold gauntlets. But it still could pass for bridal. I hope this is enough to get you inspired! I know you'll have a lovely wedding, please send pictures! Ask The Costume Goddess: Making Gauntlets. How to make gauntlets for a dance costume. Ask The Costume Goddess: Falling Gauntlets. How to prevent gauntlets from falling down while dancing. Ask the Costume Goddess: Making Armbands. For dancers who like bare arms but want to accessorize a bit. Ask The Costume Goddess: Sleeve Variations. How to make assorted styles of sleeves and arm drapes. Ask the Costume Goddess: Headpieces. Accessories for the hair.